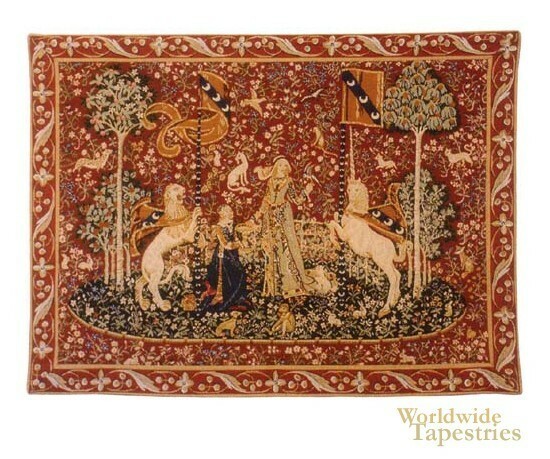 One of the six tapestries on display in Paris at the Musee National du Moyen Age, “Taste (Le Gout) IV” is part of the famed “The Lady with the Unicorn” series. Also known as “La Dame a la Licorne”, the series was commissioned by Jean Le Viste to commemorate his appointment to the royal court of Louis XI. The family crest is prominently displayed on the two banners. It is composed of three crescents against a blue stripe set on a diagonal against a background of red. The lady is tasting candy from her maidservant’s dish with her right hand, but her focus is on her parrot perched on her left hand. The symbolism and meaning of the entire series is still open to interpretation. Woven sometime in the early 16th century, the tapestry features the classic Mille Fleur style of background that was typical of pieces woven in Flanders during the time. Following Jean’s death, the series was handed down to his daughter. After her death, the set was broken up within the family. It has been since reunited and restored and hangs in a specially constructed room at the museum. This tapestry Taste (Le Gout) IV is lined and has a tunnel for easy hanging.